This topic is a long one, and for that I apologise. It could be a lot shorter but I wanted readers to be fully aware of what they are getting into, by choosing to depend solely on alternative energy instead of the mains. It is nowhere as simple as the manufacturers of this stuff like to make out. But by the end of this article you should be aware of most of the pitfalls and ready to have a go. Starting with how we got hooked, which goes a long way back now, right to the 1970s, on a trip to North Wales. We’d gone specifically to see a place we’d heard about called the CENTRE FOR ALTERNATIVE ENERGY. It’s situated just outside the town of Machynlleth, which in itself was well-worth the trip – one of the best wholefood vegetarian cafés I’ve ever eaten in (and is probably still there), an equally surreal alternative bookshop next door, plus loads of other equally inspiring alternative and crafts-based small businesses. CAT though, was by far the best. Basically, then it was still a group of people who were interested in living off the grid, as a community, and they’d rented this deserted slate quarry in the middle of nowhere to experiment with different ideas. At some point one of them had the idea of opening it up to visitors as well, though in those days (this was before the internet) all that really meant was they advertised in a few obscure magazines. The response was by no means overwhelming. The many times we went it was strange to see anyone else. But that was its charm. Being there felt like you were part of what was going on, not at all like visiting a theme park. The coffee bar/ restaurant for example, was where they ate communally too. So basically we got this amazing glimpse of a whole different way of life, and as far as I was concerned it more or less the ideal of how things should be everywhere. Combine that with it being so hidden away, and we came away smitten. From then on we knew exactly what we wanted. Unfortunately the getting there wasn’t so easy. Communal life turned out not to be the dream we thought it should be. Which meant earning enough to buy our own land. Another problem was selling our house, it took nine long years. Due partly to the market being at an all-time low throughout, and we’d got something only a few people wanted – a tiny cottage, in a remote area, huge garden, no local facilities. Still it gave us plenty of time to look around for a replacement, which we did every weekend and holiday. Except nothing ever felt even close. So when a buyer did finally match our asking price, and what with all the clearing out involved afterwards, it wasn’t until we were renting a flat, so Maureen could serve out her notice at work, that the whole where are we going to live now thing really came to a head. Living in a van turned out to be the only answer. To continue searching for land, while also allowing us to travel wherever necessary, for as long as it took, and then at least another two years while we built our new house. Which was fine in theory, except neither of us had the slightest clue how to go about it. There was no money to spend. A three-month time limit. And what were we going to do about electricity? Traditional campervans (the ones you buy already converted) are powered using the van’s already existing 12 volt DC system, expanded as necessary. A secondary battery is installed, and this is what you draw from, either with 12 volt appliances (of which there are a vast range) or by using a device called an inverter that changes the voltage up to the more normal 220-240 AC. Charging is done either partly by the van’s alternator, which isn’t very efficient when there’s two batteries and of course requires you to drive somewhere, or (mostly) from using a hook-up, which is plugging into the mains at a campsite. However we didn’t plan on being able to find or afford those. Neither do tribal van dwellers, instead they rely on a small petrol generator. Which is a really handy tool, especially when it comes to building, but not very healthy or quiet. Unfortunately we didn’t know then that you can get a propane gas version, which would have been acceptable. Leaving us with only one other option: alternative energy. It had always been our intention to power our new home with this technology, but now the van problem brought the decision forward to being decided upon a lot sooner. Find a system that could work in both, and the cost could come out of the capital. A defining moment. Not only because we were finally on our way to achieving that twenty-five year goal of living self-sufficiently. We were also getting a chance to live for a short while like nomads, totally outside any system, and doing it abroad too. While totally reliant on alternative energy. It should have been, but this was 2000, and the internet hadn’t arrived yet. Looking back now, thirteen years on and a lot wiser, it was a miracle we survived. Fitting-out the van was stressful enough, let alone with the constraints of weight and having to do everything for as little cost as possible. There were no books on the subject then, no internet, and all the local campervan dealers we visited refused to give advice. Yet despite all that, even within that short amount of time, we managed. Except for the power system, which turned into a total disaster. Right from off we were in trouble. Totally out of our depth, as to which type of generator was required (wind or solar), what size, and all the other vital bits and pieces needed. Even though I’d been on plenty of courses, read loads of books, still my grasp of even the basics (ie how electricity works) remained at a level that had no practical value whatsoever. Nevertheless I was still just as keen. It made sound economic sense, who knew where we’d find all these things where we ended up, and the van was the ideal way to learn how it all worked. To get us over this hurdle I decided to trust in a dealer. Tell them what we needed, and let them decide how to make it work. Sounded logical enough, and luckily then there weren’t that many around, so it didn’t take long to phone round. Except not one was interested. The only way any of them would agree was if we took the van to them, at least halfway across the country, and let them do the entire installation. Which of course would end up costing us at least three times as much, and with every penny coming from what we had left over to buy our land/ build a house, not something we could afford the luxury of. But left us with a real problem, we really did need electricity and the clock was ticking away. So in desperation I scoured the classified ads section of what were then the radical/ alternative magazines. Among what turned out to be eternal offers for reiki/ re-birthing/ permaculture courses/ and health supplements. And found a company offering exactly what we needed – who was prepared to work out a system for us, supply all the parts for us to assemble including a drawing, and at a price we could afford. Having got that sorted I then got back on with the van conversion, and so absorbing was it that several weeks passed before I thought about it again, mainly because we’d not heard a word. This turned out to be ominous, as it revealed the company was not what we imagined but just one man in his back bedroom doing this as a hobby in his spare time. By which time there wasn’t any alternative but to embark on a programme of damage limitation and harass him daily with phone calls/ faxes until he got back on track. Which seemed to work, except what we didn’t know then was had no intention of making good on what had been agreed upon. The bits that did eventually start to arrive were only those he’d ordered from wholesalers, who sent direct to us, and nothing else. That wasn’t apparent until a fortnight before we were due to sail for Spain. Leaving a long list of things still needed, most of which I had no idea what they were or where to look, and delaying the installation even further, right up ‘til two days before we left. Couldn’t have been any tighter. It was also the week before Christmas, and the kind of weather you’d expect in the backwoods of North Yorkshire, freezing. Especially at 7am, which is when we started, outside in the driveway of my friend Mick Bean’s house. And stayed there for twelve long hours until it was done. Or to be more accurate, switched on and found all the right lights came on. Then went home. The next morning was spent doing the rest of what was needed, including packing, followed by a party for all our friends in the afternoon. Then at dawn on Monday we set off. Into thick fog, having found during a last-minute check that the bonnet catch had sheared off and there was a worrying leak coming from the hydraulic breaking system. Three days later and halfway across Northern Spain the diagnostic panel for the power system indicated either the battery was dead, not charging, or something worse. Sadly it didn’t tell us why. That would have to wait, and in the meantime we bought candles. Eighteen months to be exact, during which solving it became an obsession, so much so that all our other problems – being confined indefinitely in such a small space (our original destination Santiago de Compostela having turned out to be a ghastly nightmare)/ not having a phone or postal address or any other means of contact/ alone in a strange country with an equally baffling culture and language we couldn’t even order a coffee in/ and all the while supposed to be searching for a piece of land, which now we hadn’t the slightest idea where it might be – were nothing in comparison. Auto-electricians had a look, we sent e-mails and letters to everyone we could think of (including the seller & manufacturer), even complete strangers. Not one could come up the answer. Then to add to our problems the van’s engine blew up, and the only person we could find who undertake the repair, was the one who could see it straight away. He also was one of the many guardian angels we’ve encountered since along the way. Not only for getting us mobile again, for next-to-nothing, but solving the mystery. It was the battery. We’d been persuaded by the guy who sold us this system to buy a specifically designed (more expensive) battery for this kind of application, rather than one for starting an engine. But neither he or the manufacturer told us that it should NOT be connected until fully-charged. However it was covered by a warranty, which arrived with the all-important warning and installation instructions several weeks later (at the place we were renting), so all was not lost. Or so we thought. Contacting either proved impossible. It took another three months and the threat of legal proceedings (thanks to a very helpful trading standards officer) to elicit one. And then merely a terse e-mail (from the manufacturer), referring us to the very small print, the bit stating that any claim has to be first inspected by them, which meant returning the battery at our expense, and it only applies to products used solely in the UK. Very neat. And a lesson for us all. Expect nothing and you won’t be disappointed. By then we’d had more than our fill of looking for land where it patently didn’t exist, while trying to remain sane, so boldly decided to try further south and another country, Portugal. For which we would need a new battery. This was solved once again by our wonderful mechanic, who assured us any ordinary car/ van type would do just as well, plus work out a lot cheaper. And that was a very special moment. Knowing that finally, with no previous experience, Mick & I had actually put all this stuff together and it really did work, retribution enough. As we headed off for yet another adventure, this time accompanied by three feline companions, a reminder of our eighteen months of exile in Galicia. What happened next proves that things can get a lot worse. While on the move everything functioned perfectly, the van’s alternator kept the battery topped up and it was summer so the load was light. But as soon as the travelling stopped, and the van remained parked up for more than a day or two, in no time the battery was dead again. The reason? We’d made an even bigger mistake. Looking back this is not surprising. 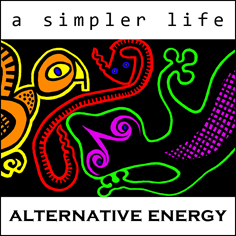 Despite the hype, alternative energy is impenetrable and will always remain so. The sole province of geeks and from another planet. Even now I have yet to find a single person who can explain how it works, what a volt/ watt/ and amp, or a system that actually works. During the fitting-out I asked the Head Electrician at the West Yorkshire Playhouse (where Maureen was working, and the biggest theatre complex outside London) to tell me what size plug I needed for a particular connection, and he hadn’t the slightest clue what I was talking about. During our travels up until this point we’d not met any other van dwellers/ nomads/ or even conventional campervanners. But down in the Alentejo region of Portugal they swarm like flies. It is just like owning a classic motorbike or car – everyone flashes their headlights at each other, waves are exchanged, and you are never alone when parking up. And not one of those had anything like the power system we had. Lots of solar panels, petrol generators. We were the only one with a wind turbine on the roof. And why was this? Because at the time it sounded totally logical. Far more efficient than solar panels, cheaper too, a lot healthier and quieter than generators, and works both day & night/ rain or shine. But more importantly, exactly suited to the region we had originally decided upon: Cape Finisterre, the wettest and wildest part of Spain. 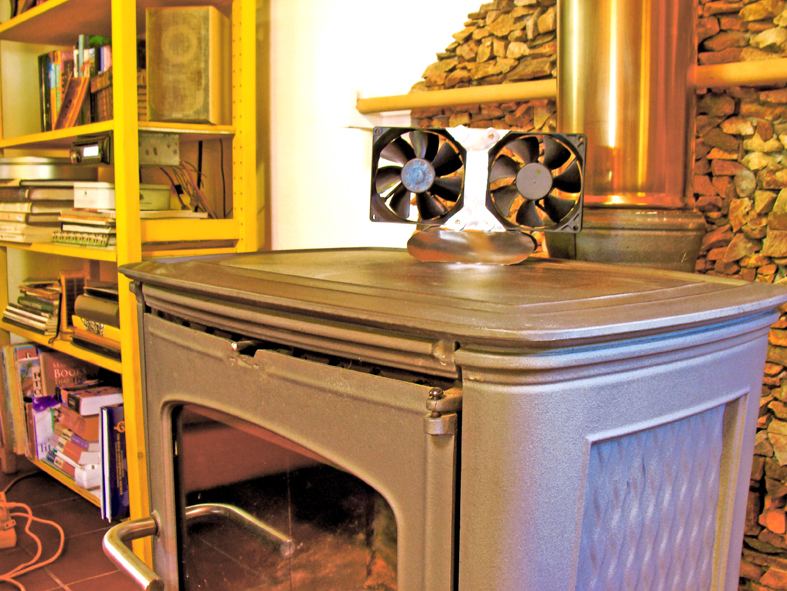 Plus our adviser claimed he powered his entire home with one (an AIR 403/ now X). Wind turbines. We saw them first at CAT, and then just before we left the UK they had become so popular the government was offering grants to fit them to conventional homes and the diy stores stocked them. The smallest (100-400 watts) also really do appear to be amazingly efficiently, you only have to breathe on the blades and they start spinning/ generating power. Okay, 100-400 watts doesn’t sound very much, but when they cost from £700 to several thousand each (and that’s without the tower and all the necessary supporting equipment) then that’s good enough. What we didn’t realise though, is spinning blades don’t necessarily equal actual power. In fact to get even a single watt out of one of these (an AIR 403/ X for example) requires at least 25-30 km/ hr of wind, 3-4 hrs a day, every day. And for that you get enough power to run a laptop for just over an hour. But that’s not all, the wind has to be clean too. Which means free of any turbulence, from surrounding objects (trees, buildings, geography), so effectively mounted twice the height of any of those, within a radius of 500 ft. And the one on our van, how high up was that? Three metres off the ground, it didn’t stand a chance. Now let me give you a couple of real life examples to show what I mean. Where we live now is good one. It’s 600 metres above sea-level. The land slopes away steeply (almost vertically) and after that there’s nothing anywhere near as high for about 60 km. Perfect in fact. Yet to ensure a clean airflow we’d still need a 10 m tower. And 25 km an hour, what does that feel like? Well, there was one occasion (only one) when the van turbine did work. We were driving along a mountain ridge in Galicia, it was well over 3000 ft, and suddenly a storm engulfed us. 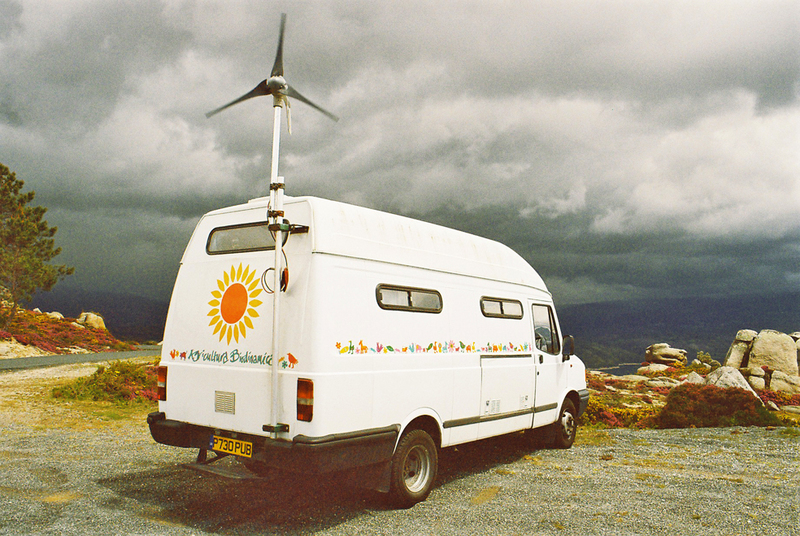 It was so wild the van was rocking, so we stopped and parked up to wait it out, using the opportunity to connect up the turbine. I nearly lost my arm doing that, the massive blades started turning immediately, before I could lock it securely and get clear. Then spun round so fast I thought they’d break up. The noise was pretty awesome too, a kind of screaming and very loud (the friction on the blades), combined with vibration down the pole inside the van. At one point the meter showed 400 watts coming in. Not an experience I would like to repeat, and luckily the storm passed by as quickly as it had come. How much power did we generate? Enough to run the coffee grinder for a single espresso. Time heals. Or at least the pain diminishes, though I would still like to inflict unspeakable acts on the person who advised us. We even managed to sell most of the equipment, which in hindsight was yet another big mistake. Then finally came across El Pocito. Where once again it was time to address the whole issue of powering our home using alternative energy, including pumping water up from a borehole. We still weren’t any the wiser, and now in a foreign country where we didn’t know a soul, let alone folk who were using these systems to ask. But it did seem like alternative energy had moved on a lot in nine years, and a lot more popular, probably because of the climate here, as there were plenty of suppliers/ dealers advertising locally. Enough to get ten different reps to come and meet. All of whom chose a local bar, not one thinking it would be far more relevant to visit the actual site. Not a good omen. Then all coming up with a completely different solution. The only thing they did agree on was the price, astronomical. Around fifteen times more than we eventually paid out. Talking to these people, who unashamedly admitted they had no actual experience, was both weird and life-changing. It finally convinced us that from now on we’d do a lot better at everything if we made all the decisions ourselves. Our power system is therefore the most efficient and basic possible. Basic because we knew we’d make a lot more (costly) mistakes. Most of the parts were second-hand, much for free from systems long abandoned, the new bits we got from the internet at virtually wholesale prices. Total outlay (on the house system) 1,000 euros (£800). There has been a lot to learn, and still a way to go. Far more than any books or courses will tell you. But while stressful trying to understand, it has all been a positive experience, enough for me to feel able to write about how ours works so others can use that as a base for building their own. But before I get into the technical stuff, here are a few thoughts about what you need to consider first, when choosing alternative energy over the mains. Cost. Two of the reasons we wanted to generate our own were: a) alternative energy is a limitless source of free power, so once we’d bought all the equipment there would be no more bills, and (b) if we bought land where there was never any hope of getting a mains connection, it would be a lot cheaper, enough to pay for the entire installation. Both proved to be totally false. In Spain (and some parts of Portugal) land in the countryside is undoubtedly a lot cheaper than say the UK, but only in places where no-one in their right mind would ever want to live. Also, buying the system is not the end of the story. To start with all this stuff is ridiculously overpriced (even if you do the installation yourself). For example, when we last used mains power our consumption was down to an average of 25 Kw units a month (check with your last bill to appreciate how little that is). To match even that potential, with alternative energy, would require a system costing at least £15,000 (or if you want to work it out for more power, around £600 per Kw unit). Then there is the depreciation factor. This is something I hadn’t even considered. Nothing lasts forever, and some day it will all have to be replaced. The salesman will tell you 10-15 years is the average, some bits last a lot longer (panels for instance, but all the time diminishing in efficiency) others a lot less, especially if you have the misfortune to be struck by – lightning/ high wind/ flash flood/ or theft, or are slapdash about looking after it properly. Batteries for example, which can be the most expensive part, could last twenty years or as little as one, all depending on how you treat/ maintain them. It’s not looking so free or cheap now, eh? Even we, with a system worth £1000 have to put aside £100 a year to cover replacements, and that’s to generate no more that 5 Kw units a month. Suitability. Choosing the most appropriate system. Happily (for us) we are not the only ones to have made gross errors in judgement, every installation I’ve seen has at least one glaring fault – panels sited at the bottom of deep dark valleys/ fixed in one position so they only get a few hours of sun each day/ some even facing completely the wrong direction/ wind turbines mounted far too low/ two near here that are totally surrounded by trees/ water turbines where the source runs dry for most and sometimes all the year. But say you did manage to get everything right. Then you still have to reckon with the unpredictability factor of the raw material. Because no matter how good your site is, how big or expensive your system, you can’t control nature. When or how sunny/ windy/ wet it will be. Take here for example. On paper it’s a classic choice for solar. Clear horizon, right round from the NE in the morning (height of summer) to the West, and an average of 300 days of sunshine per year. What more could you ask? Well for starters, what about the 65 days when it isn’t sunny? These occur only between Nov-April, so that means during those months half the time there won’t be any power. Dealers/ installers will tell you they can cover for this by adding more battery capacity, tide you over. And yes in theory you can, if the bad weather is only going to be for a day or two, but it will cost a lot more (initially and to replace in the future), and can you be certain of having enough sun to recharge all this extra capacity, or will it require more panels too? Also the quality/ power of the sun varies even during a cloudless day. If for example you bought a 100 watt panel to use an appliance rated at 100 watts, it would only be able to function at best for about an hour a day, and then only in the summer, when the sun is directly overhead. At other times, power generated is significantly less than the rating of the panel. Bearing all this in mind the next question should be: IS ALTERNATIVE ENERGY FOR YOU? Deep down, are you just looking for an expensive toy? Or even if sincere, prepared to add a (petrol) generator, so covered for all eventualities? If the answer is yes to either then alternative energy really isn’t for you. If no, do you feel able to maintain and repair it all yourself? And more importantly, are you prepared to drastically change how you use electricity? Because if there is any doubt stick with a mains connection and skip the rest of this chapter. When you live in a conventional way it can appear impossible to imagine any other way of doing the basics (power/ water/ heat/ food). Let alone where your dependence on electricity for example, will have to shrink dramatically, to a tiny proportion of what you currently rely on. Where it will only be possible to use a fraction of those appliances, and then only if and when there is enough power, sometimes not at all and for days on end. Literally becoming organised enough to flow with the vagaries of the weather. Here’s how we do it. Our first priority every day is to charge the battery, which is only for use during the evenings. Until that is done we cannot use any appliances. The battery we have at the moment is an off-the-shelf car/ van type, rated at 250 Ah, and the process takes around half an hour in summer to all day in winter. There are two 50 watt solar panels to do this with (wired in such a way to give 100 watts at 12 volts), mounted on a pole which has been designed to swivel (see drawings at the end) so we can keep them orientated in full sun all day. When the battery has charged, and then only if there is still sufficient sun shining, we can use appliances, up to a maximum of 50 watts in total at a time, and only for as long as there is still full power coming in (not on cloudy days). This way the appliances are effectively running directly off the panels (and don’t worry if you can’t follow any of this). An hour before the sun sets we stop using appliances. The battery then becomes our only source of power. I said it is rated at 250 Ahs, but we actually only use 10% of that (25 Ah). This sounds a little crazy, but there’s a very sound reason why. Battery life is measured in a predetermined number of complete discharges. If you never let that happen then expectancy is dramatically extended, possibly by up to 10 years (25 for alternative energy types). 25 Ah, for those who have no idea what that means, translates into usable power like this: 25 Ah x the system voltage (12 volts) = 300 usable watt/ hrs. So an appliance which is rated at 100 watt can be run for up to 3 hrs. It’s not a lot, but a (12 volt) 10 watt light bulb for instance (equivalent to a 60 watt conventional one) will consume only 10 watts an hour, and a small laptop (we watch films on one) with the sound fed through a car stereo, perhaps only 50 watts an hour, so running all those for two hours for instance (10 x 2 = 20 watts and 50 x 2 = 100, added together = 120 watts, divided by voltage (12) = 10 Ah) is well within the capacity. On the days when there isn’t any sun (or until we build a wind turbine) we adapt. Either putting off the jobs that require electricity, or by using hand-powered alternatives instead, like – a treadle sewing machine/ washing clothes by hand/ hand-cranked mincer/ wind-up radio/ candles/ broom/ and of course a whole spectrum of hand tools. Commitment. Despite its potential, alternative energy is always going to remain the domain of a minority, those who are truly dedicated. So you are not going to find a handy local dealer/ installer prepared to design it properly, help later, or turn out in emergencies. Nor can this thing think for itself, you have to do all that. From realigning the panels every half hour, to remembering to lock them down each night or if the weather turns nasty. Constantly aware of what is happening so things run smoothly, spotting problems early enough to order replacement parts. The panels have to be kept clean too. The battery checked and topped up, at least once a week. Do all this diligently and things will run relatively smoothly. Anything less and the system will end up costing a good deal more and be far less efficient. – panels. Buy the best make possible, german or at least an internationally well-known brand, but not BP as their products are terrible. 100 watts of capacity is fine, but if I was replacing them now I would chose slightly more, 150-170 watts. If there are two panels make sure they have the same number of cells, or fit a diode to ensure the power flows only to the charge controller. Second-hand can often be as good as buying new, just check the cells are all still functioning. This can be done by reading the voltage (if it is still connected) or with a multimeter. Each cell generates around 0.55 volts in full sun, so just divide the voltage by the number of cells. Anything over 12 volts will charge a battery but the higher the number the quicker it is. – fused switch or plug/ socket. This is to isolate the panels when you need to do maintenance. Make sure they are rated at least 150% of the power that could pass through. – charge controller or regulator. The box of electronics that takes the raw power from the panel(s) and feeds it to the battery, in a way that is: safe/ charges most efficiently/ and cuts off the current when the battery is full. The most up-to-date type uses what is known as mppt technology, which is more expensive than a standard controller but will more than pay for itself in extra performance (especially in the winter). Make sure it comes with the all-important display panel (in volts/ watts/ and amps) and enough cable to reach right through into the house. – battery. As this can be by far the most expensive part of a system, always go for the cheapest option then look after it. Ignore everything dealers/ installers tell you (remember they earn by commission). Stick with 12 volt even though there are many other voltages, all far more efficient, but commensurately more expensive, plus all the other parts of the system will have to be changed as well, not a good path to head down. Buy a single battery, otherwise if one fails they all need to be replaced. I reckon the ideal capacity for two people is 250 Ah. They are also very heavy (ours weighs 66 kilograms), so you will need at least two very strong people to carry/ manoeuvre them into position. – inverter. This is what transforms the battery’s DC voltage into 220-240 volt AC, so you can use conventional appliances (12 volt DC appliances run direct off the battery). Choose a model that produces a sine-wave output. This is more expensive, but sensitive appliances like computers won’t work otherwise. To match up to 170 watts of panel(s) you don’t need anything bigger than an output of 100 watts. Make sure it has silent operation too, as the cheaper models use really loud fans. size in mm2 = 0.0546 x Amps (max from panels) x distance (m). The larger cable sizes will be too big to fit onto the terminals of the equipment (anything more than 2.5 mm2), so for those you will also need appropriately rated/ sized connector boxes at each end to run thinner cable from, or cut the end of the cable to fit. Remember that using cables not thick enough (for the power they carry) can heat up and catch fire. Not only does everything need to be placed as close together as possible, some goes in the house and the rest in a building outside, separated by only a wall. The inverter is indoors, so you can switch it off when not in use, as is the display panel for the charge controller. Everything else is on the other side. We built an extension for this, which also doubles up as the tool-shed, where it is always dry/ cool/ and frost-free. 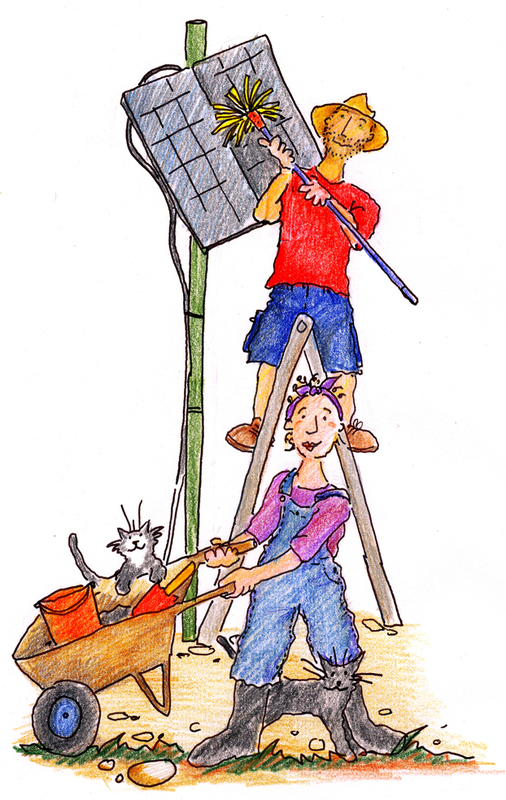 The solar panels need a mount. Do not buy one of these, use the drawings below to design your own and have it made up. Main things to bear in mind – it needs to be able to cope with very high winds/ swivel to stay aligned with the sun/ overall height remain as low as possible to conserve rigidity and make it easy to clean/ maintain the panels. The charge controller is fixed to the wall, behind which you need to fit a metal sheet (galvanised is perfect) or spacers to help dissipate the heat. Mount the fused switch nearby. The inverter fixes to a wall too, as does the display panel (remember to put it where it can be read easily). You’ll also need sockets, for both the 12 volt and 240 volt supply, located as close to the rest of the equipment as possible. Mark the 12 volt socket so you know which is the positive (+) pin, as well as all the plugs of your 12 volt appliances. Important stuff to remember. People will tell you 12 volt DC electricity can’t kill. Wrong. If you accidentally (or thoughtlessly) allow the positive battery terminal to touch the negative one, with something that conducts electricity (metal, wet hands, etc), it becomes lethal and can even melt metal. DC electricity and equipment also only works when you connect everything correctly. If you don’t, and are very lucky, nothing happens, but most likely it will instantly fry everything in its path and your precious investment will become a worthless piece of junk. Always remember: RED is for LIVE (+), and BLACK is NEGATIVE (–). If you are worried that the bare cable ends might touch during installation then tape them over temporarily. Cover the clamps that bolt onto the battery poles with a cloth while waiting to fit, leave nothing to chance. Wear latex gloves. Whenever connecting the battery (and this applies with cars too) always attach the positive first. Disconnecting, remove the negative first. Start by doing the cabling between the charge controller and the 12 volt socket for the house, followed by charge controller to the clamps that will eventually connect to the battery, but don’t fit them yet. Then between the inverter and the clamps, again don’t connect. Followed by the fused switch to the battery clamps, ditto. Next the display panel to the charge controller. Then finally the fused switch to the solar panel(s), after making sure the switch is in the OFF position and the panels are covered with something lightproof. Do not join panels to each other, instead connect them by running a short length of cable from each to a connector box. When all that’s done, and having checked everything twice, then it’s almost time to make the final connection (to the battery). First though, ensure the terminals are clean/ shiny (a wire brush is perfect for this), and smear them with some Vaseline to prevent corrosion. Fit the positive (+) clamp first, tightening with a spanner, then the negative (-). If you’ve done all this correctly (no loud bang/ bright flash/ or puff of blue smoke) then the charge controller leds should light up with the correct sequence, and the display panel show the voltage in the battery. DO NOT connect any appliances yet, as the battery still has to be fully charged first. To do this open the fused switch, align the panel(s) with the sun, and check with the display panel for a voltage/ wattage. Aligning the panels. This is really easy (though it took me a year to work out). Somewhere on the mount will be a shadow when it is in the correct position, use this. It should also be possible to alter the tilt, though I haven’t managed to work out an easy way yet. Before using any appliances ALWAYS fully charge the battery first. Make this a daily mantra. Charging the battery. The sun rises and sets in a different place every day of the year. It also varies in angle of ascent/ descent and speed – both higher and faster in the summer – as well as the amount of power it gives out. How often you need to align them is therefore something you have to develop a feel for, it’s usually between 30-60 minutes. The display panel (if you have one) will tell you what is happening, during the charging phase you will see the wattage coming in, wait until that stops or the voltage reaches 14.8. That’s the highest the voltage is ever going to go, then drops it back to 14.2. ONLY then, and if still sunny, can you use appliances (up to a maximum of 100 watts for 150-170 watts of panel, 50 watts for 100 watts of panel). If at any time the voltage drops below 14.0 switch off the load and check the alignment. If you don’t have a meter you can use a mathematical formula: CHARGE TIME (hrs) = the number of Ah used x 1.15 divided by the CHARGE RATE. The CHARGE RATE being the real amount of watts coming in from the panels (say 50% of rated) divided by the voltage of the battery. Using the battery at night. The very first time you need to check the voltage first. This is to discover what the true 100% voltage is (every battery differs), which will only become apparent two hours after power has stopped coming in. For some reason it’s not marked on the battery. Once you know that, then comes the hard bit, working out what the voltage should be when you have used only 10% (the maximum you should ever consume). The simplest method is to choose a 12 volt appliance (not 240 v, as the inverter consumes some power too) and run it for 10% of your battery Ah capacity x 12 then divided by the appliance wattage. This gives you the length of time (in hours). At the end of that note the voltage, after letting it rest for about half an hour. The only other thing you need to know about the battery is how to check the liquid levels. This can be really difficult. What I’ve done is cut a short piece (about 6”) of brightly coloured plastic pipe, measured the exact distance from the top of the inspection hole down to the maximum liquid level, and threaded a piece of stiff wire through it at this point, so when inserted it rests on the top and inside at the bottom end it should touch the liquid. If not top up with distilled water. A word of warning, this is acid you are working with, so always wear appropriate gloves and old clothes. And have a bottle of baking soda mixed with water (until it becomes a paste) handy to neutralise any spills. And that’s about it. If you have any questions or advice please do not hesitate to get in touch, we should aim to help each other. Once you’ve accepted that a good quality car radio can be just as good to play and amplify CDs as an expensive 240 volt stereo system, using conventional high quality speakers, then there’s no limit to what else can be fashioned from recycling 12 volt bits and pieces. It’s a lot cheaper too, and uses far less energy. Our first foray into this world began a year ago, when it was clear we’d need a FAN, to keep cool indoors during the hottest weeks here in July and August. Generally the walls are thick enough to maintain a pleasant working temperature, but if outside remains at over 40C for more than a few days then there’s nothing you can do. I trawled the internet, found plenty of fans, a fair number 12 volt too, though few with low enough wattage to run directly off our tiny panels. They were all very expensive as well. Then as I was using our ancient laptop, I became aware of a rather pleasant breeze emanating from underneath. Possibly just the thing. A mention on the blog, asking if anyone had any redundant computers from which the fan could be removed, resulted in a package, and I set to work. They are both from a desktop computer. Measuring 92 mm square. And the voltage/ amps clearly marked. Both are 12 volt, which is so lucky. One uses 0.3 amp (amps x volts = 3.6 watt), the other 0.56 amp (6.72 watt). Wired in parallel (red to red, black to black) that means they will need 10.32 watts, hardly anything at all. They did require some kind of base though, to hold them upright when spinning. Using a scrap piece of galvanised sheet I made what you can see in the photo below. Not as elegant as I’d hoped, but it does the job and the fans are sufficient to keep the temperature from rising. More appliances as I think of them.